Run in a single Office application (Word or Excel), or several applications. Run only in versions of Office that support API members that your add-in uses. This article helps you understand which options you should choose to ensure that your add-in works as expected and reaches the broadest audience possible. For a high-level view of where Office Add-ins are currently supported, see the Office Add-in host and platform availability page. The following table lists core concepts discussed throughout this article. Office application, Office host application, Office host, or host The Office application used to run your add-in. For example, Word, Word Online, Excel, and so on. Platform Where the Office host runs, such as Office Online or Office for iPad. Requirement set A named group of related API members. 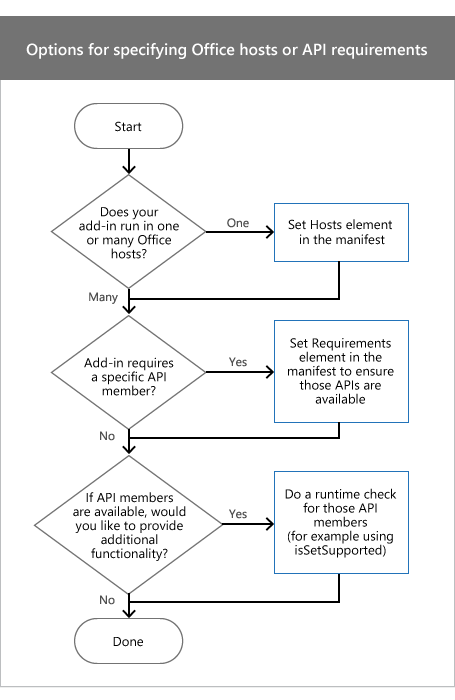 Add-ins use requirement sets to determine whether the Office host supports API members used by your add-in. It's easier to test for the support of a requirement set than for the support of individual API members. Requirement set support varies by Office host and the version of the Office host. Requirement sets are specified in the manifest file. When you specify requirement sets in the manifest, you set the minimum level of API support that the Office host must provide in order to run your add-in. Office hosts that don't support requirement sets specified in the manifest can't run your add-in, and your add-in won't display in My Add-ins. This restricts where your add-in is available.In code using runtime checks. For the complete list of requirement sets, see Office Add-in requirement sets. Runtime check A test that is performed at runtime to determine whether the Office host running your add-in supports requirement sets or methods used by your add-in. To perform a runtime check, you use an if statement with the isSetSupported method, the requirement sets, or the method names that aren't part of a requirement set.Use runtime checks to ensure that your add-in reaches the broadest number of customers. Unlike requirement sets, runtime checks don't specify the minimum level of API support that the Office host must provide for your add-in to run. Instead, you use the if statement to determine whether an API member is supported. If it is, you can provide additional functionality in your add-in. Your add-in will always display in My Add-ins when you use runtime checks. Your add-in's manifest must use version 1.1 of the add-in manifest schema. Set the OfficeApp element in your add-in manifest as follows. When you specify Office hosts or API requirements, there are several factors to consider. The following diagram shows how to decide which technique to use in your add-in. If your add-in runs in one Office host, set the Hosts element in the manifest. For more information, see Set the Hosts element. To set the minimum requirement set or API members that an Office host must support to run your add-in, set the Requirements element in the manifest. For more information, see Set the Requirements element in the manifest. To make your add-in run in one Office host application, use the Hosts and Host elements in the manifest. If you don't specify the Hosts element, your add-in will run in all hosts. For example, the following Hosts and Host declaration specifies that the add-in will work with any release of Excel, which includes Excel for Windows, Excel Online, and Excel for iPad. The Hosts element can contain one or more Host elements. The Host element specifies the Office host your add-in requires. The Name attribute is required and can be set to one of the following values. The Name attribute specifies the Office host application that can run your add-in. Office hosts are supported on different platforms and run on desktops, web browsers, tablets, and mobile devices. You can't specify which platform can be used to run your add-in. For example, if you specify Mailbox, both Outlook and Outlook Web App can be used to run your add-in. The Requirements element specifies the minimum requirement sets or API members that must be supported by the Office host to run your add-in. The Requirements element can specify both requirement sets and individual methods used in your add-in. In version 1.1 of the add-in manifest schema, the Requirements element is optional for all add-ins, except for Outlook add-ins. Only use the Requirements element to specify critical requirement sets or API members that your add-in must use. If the Office host or platform doesn't support the requirement sets or API members specified in the Requirements element, the add-in won't run in that host or platform, and won't display in My Add-ins. Instead, we recommend that you make your add-in available on all platforms of an Office host, such as Excel for Windows, Excel Online, and Excel for iPad. To make your add-in available on all Office hosts and platforms, use runtime checks instead of the Requirements element. TableBindings requirement set, which has a minimum version of 1.1. OOXML requirement set, which has a minimum version of 1.1. The Requirements element contains the Sets and Methods child elements. The Sets element can contain one or more Set elements. DefaultMinVersion specifies the default MinVersion value of all child Set elements. The Set element specifies requirement sets that the Office host must support to run the add-in. The Name attribute specifies the name of the requirement set. The MinVersion specifies the minimum version of the requirement set. MinVersion overrides the value of DefaultMinVersion. For more information about requirement sets and requirement set versions that your API members belong to, see Office Add-in requirement sets. The Methods element can contain one or more Method elements. You can't use the Methods element with Outlook add-ins. The Method element specifies an individual method that must be supported in the Office host where your add-in runs. The Name attribute is required and specifies the name of the method qualified with its parent object. // Code that uses API members from RequirementSetName. RequirementSetName (required) is a string that represents the name of the requirement set. For more information about available requirement sets, see Office Add-in requirement sets. VersionNumber (optional) is the version of the requirement set. isSetSupported does not work in Outlook or Outlook Web App. To use a runtime check in Outlook or Outlook Web App, use the technique described in Runtime checks using methods not in a requirement set. The following code example shows how an add-in can provide different functionality for different Office hosts that might support different requirement sets or API members. // Run code that uses API members from the CustomXmlParts requirement set. // Run additional code when the Office host is not Word 2016, and when the Office host does not support the CustomXmlParts requirement set. We recommend that you limit the use of this type of runtime check in your add-in's code. The following code example checks whether the host supports document.setSelectedDataAsync. // Run code that uses document.setSelectedDataAsync.